Now that I am living fulltime at Lone Wolf RV Park, I do not have much to do during the day. I asked my friend John about that. He told me, "Relax. Smell the flowers." Probably good advice. Recently I got a library card. There is a library branch here in Apple Valley. I'm planning to go there and get something to read. Not terribly exciting. 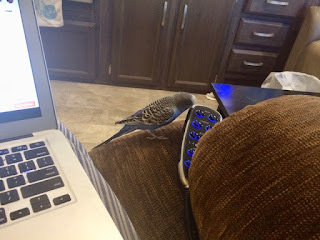 My friend Boid is hopping around the La-Z-Boy as I am typing this Blog post. Boid is very a very entertaining little guy. He likes to peck at things. Hi George, looks like there are a couple of public golf courses right near you...Jess Ranch, and Green Tree. Maybe check them out if you are finding a lot of time on your hands? And speaking of flowers, all the reports I am hearing say that this year's flower display in the desert is the best in decades. So John might be onto something there...a flower appreciation side trip with Scampy maybe? Not hardly any flowers in the fields near Apple Valley. Maybe at a lower elevation? Nearly everybody that I know has pain problems. I am lucky. No pain. I gotta feeling that my physical condition without pain has a lot to do with going to 24 Hour Fitness every other day. Check out the Hesperia Library on 7th street just north of Main Street. Much bigger, more selection. The Apple Valley Library is in a temporary modular. You can also go online and put movies and books on hold from any of the branches in the countywide system and have them delivered to any branch. Also, check out the town of apple valley on facebook if you do facebook. They have things going on all the time. Summer in the high desert of Apple Valley is not all that bad, and it being a dry heat it is very tolerable. The Apple Valley branch library is small. It's not bad though. I am able to get online there and watch movies using their WiFi. That's something that I cannot do using my Cricket Personal Hotspot because of data limits. Speaking of desert wild flowers, we just returned from a day trip there. There were wildflowers, but I wasn't impressed. I think in the near future there will be more blooms. Consider Little Blair Valley. Very pleasant area, boondock camping, and great wildflowers at the right time. I'll check out Little Blair Valley on the net. Thank you! When you feel ready - maybe start a little social Life. Apple Valley Senior Citizens Club has a dance every Saturday night. Open to the public and various live bands play everything from classic rock to country. You can just go to enjoy the music, have a coke and a snack, and socialize. There are always more women than men at these events - and I bet Tioga George would be a very popular guy. I've driven by the Senior Club. Never gone in yet. I believe you can have the best of both worlds. Have a routine like the gym, daily walks, reading, a movie or two and a few days here and there a boondocking trip. Nothing is set in concrete and the most important is not to relax too much. Keep moving! Your comment is something that I should pay attention to. I've been somewhat stalled out lately. Got to get more active! I know you've been struggling with cell phone data limits and costs. I previously sent you a link to rvmobileinternet.com I don't know if you checked it out or not. But.....they recently discussed an AT&T rural plan that gives you 250GB of data for $60! It supposedly is only good in a few states (not CA) but the authors were able to sign up from FL which is not on the list. I read your linked story. It may not work for me.